It’s no secret that the holidays can be a very stressful time of year. The extra expectations, events, and parties that are supposed to be magical and wondrous can fall short. Too often, the season can leave adults frazzled, and as the snowflakes dance softly from the sky, children, too, can become overwhelmed. In spite of the stress, children with autism are often expected to play merrily about amidst the chaos of the adults’ hectic chosen schedules. Most individuals believe they are choosing to make all this fun for the kids and that they can recover from the lack of sleep, be resilient, and have a ton of fun—but that’s not always the case. 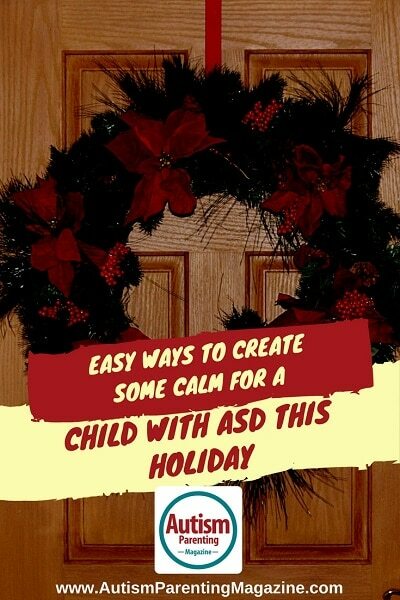 Unfortunately, for some children with autism, the pressure to create “holiday happiness” for them can lead to a variety of behaviors, such as self-injury, rocking, and even hiding, all while desperately attempting to communicate the need for security. How can we expect children with autism to communicate their needs and feel safe with everyone bouncing about? How can we make the holiday season a peaceful one for everyone? 1. Do not show up unannounced, EVER! A simple phone call or email ahead of time, preferably the night before, asking for the best time to visit is enough to ease the surprise it bestows upon the child and the parent. Children with autism often need to prepare themselves for what will happen next, and if a schedule is altered, they may not respond well. Think of the child and what is in the child’s best interest, not yours. As you are coming through the door, keep your voice in a lower regimen. Leave gifts and packages in the car so the child is not overwhelmed by something other than your person. Greet the child as you would a sleeping infant while using a slow and whisper-like speech. Speak with the parent and welcome the child to come to you, never go after the child. Keep your voice calm if you want to call his/her name, but do not call more than once. However, in the same instance, he/she may be choosing to ignore you until ready to say hi. Allow the child to reject a display of affection and accept it. The child is in control as to how he/she feels, and forcing love and affection may send his/her body into sensory overload and trigger a meltdown. You are the adult, and by that title you must accept that all individuals feel differently. Please do not take the denial of a hug or goodbye personally. Special needs parents have enough to deal with on a daily basis, so no matter how close you feel you are, this is just another factor that may push them away from you. It is incredibly difficult constantly being told how another person believes you should raise your child, especially if those strategies are ones used to raise a typical child. So, if you care about the parent, allow the parent to confide, vent, and cry to you, but do not judge them in their struggles—support them. It is often extremely hard for a parent to ask for help when there are so many tasks that need to be dealt with in a timely manner. If you want to help, do not suggest that the parent get a cleaning service in order to get a small break. Instead ask how you can help and really listen to what the parent is saying. Accept and follow through with what he/she said while offering your help whenever it is needed in the future. If you truly want to be helpful, assist in the ways communicated to you. This is a very touchy subject, but it has a relatively simple explanation. A parent raising a child with autism may not be able to show love in the ways you would expect because of sensory issues, so it may seem like those extra hugs go to another child. However, this behavior does not suggest favoritism to another child. The parent must show love in an appropriate way for each child’s benefit. Secondly, a parent will already be aware of the signs of autism and does not need to believe that other people are judging as well as attempting to diagnose the other children. The simple suggestion may negatively impact your relationship. Comments such as, “You are doing too much,” “Let me help you out sometime,” “Let me watch said child for the day so you can relax,” are way too general. Instead say something like, “Can I please make dinner for you at a specified time?” or “Can I become a regular caregiver for said child?” and “I would be willing to learn how to care for your child in the appropriate ways or manner that you would like.” These suggestions are concrete without making the parent feel as if he/she is failing in your eyes. Refrain from buying a child a toy that you feel is a lot of fun; instead buy the family a gift card to a store (preferably online) so that the parent can pick out what the child may need. This helps to not overstimulate the family with another chore of either disposing of the item or adding more stress to the family unit by the intrusion of the toy. Try not to make or have expectations for what you want to happen at your visit. Having a child with autism is extremely different than raising a typical child, so please understand that this family needs to function in their own way. These parents are doing the best they possibly can with the child they have been gifted, and you need to be OK with that. Bonus tip: If you see a child with special needs out in public, and you must look at them or a behavior, just smile while you look. Please don’t point and stare. These children deserve the same respect you would give your own child. Janele Hoerner is the author of Loving the Soul Beneath the Autism: An Interior Analysis of the Impact a Special Needs Child Bestows upon the Family. Her award-winning book details her oldest son’s life from in utero through his diagnosis at three years of age and concludes with the beginnings of his first year of school at five years of age. She believes her son is the greatest gift that she has ever received and wishes to help all individuals come to understand that special needs individuals are an important part of our society as they teach us to become selfless. She lives with her husband and their five children, two of which are on the autism spectrum, in central Pennsylvania.